As part of the ongoing focus on the illicit drug trade, officers are revisiting locations known marijuana cultivation areas. 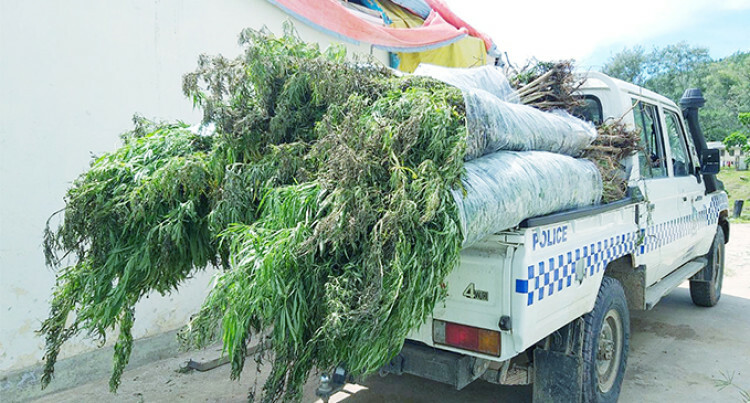 More than 2,000 plants believed to be marijuana has been uprooted from various farms in Kadavu. The plants were uprooted from farms located at the villages of Nacomoto, Namajiu, Mataso, and Rakiraki. The success of the raids have been largely due to information received from members of the public and we are encouraged by this. The M.V Veiqaravi was deployed to Kadavu yesterday to transport the plants believed to be marijuana to Suva for analysis. The owners of the farm are known to Police and investigations continue. And drug operations continues in other Divisions. The Eastern Division operations team conducted a raid at the home of a market vendor located at Cakobau Road in Vunimono, Nausori where they found 1 a clear plastic bottle containing dried leaves believed to be marijuana. The leaves have been sent for analysis while the 40-year-old suspect is in custody. Meanwhile a taxi driver has been charged with one count of found in possession of illicit drugs after he was allegedly found with a small clear plastic containing white crystals which was later tested positive to be methamphetamine. The suspect’s vehicle was searched along Barara, Queens Road on Friday.l where the alleged discovery was made. Meanwhile the 50year old suspect who was taken in following a raid in Drauniivi village remains in custody as investigations continue.